The bell rings for lunch and the boys come running to the barn. Hank and Lyle get there first – they're like cafeteria bullies, always trying to steal the littler kids' sandwiches. 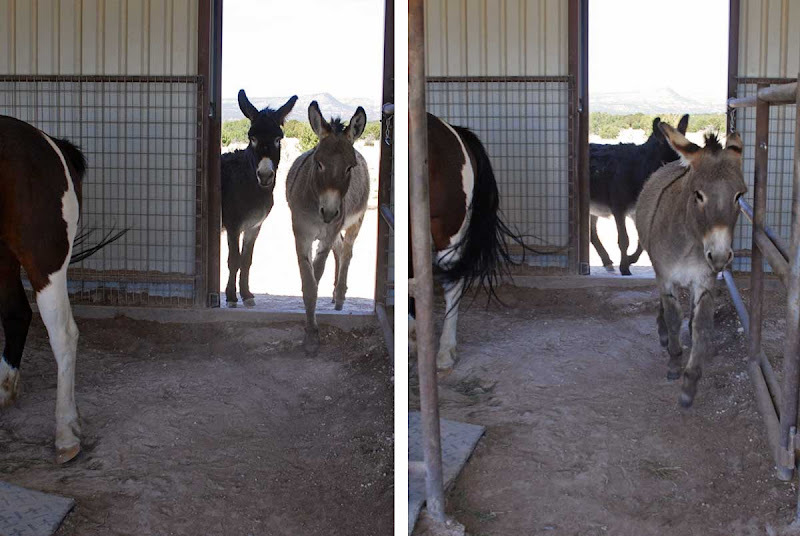 Alan and George finally arrive, to find themselves in the same pickle they were in at this time yesterday, and the day before that, and the day before that: to get to their hay tub, they have to go through Lyle's or Hank's stall. They'll stop and look at Lyle, then decide they'd rather take their chances with Hank. No, you go first. I went first yesterday. I never tire of reading about your critters. "You think maybe she rearranged things so we don't have to pass those big guys?" "Nah... I told you we should have come in early." It's amazing how expressive they are as they stand in the doorway figuring out (again) what to do. Poor guys! They are just too darn cute. Those ears! love your animals...they have such great personalities and the way you tell your stories..I feel like I'm right there. Funny! I love the look on their faces as they make the mad dash. That's priceless! You've completely captured the exchange and what must surely be going through everyone's mind. Poor George & Alan. Maybe they should enlist Deet's help with the bigger boys. Very funny, the poor little guys having to go through that everyday. I'm sure one day they will figure it out and come in earlier than the big food bullies. Do you think they'd have the nerve to pin their ears at Lyle and Hank? They need to bring Wynonna with them for moral support. Arlene, you've given me a subject for another post. 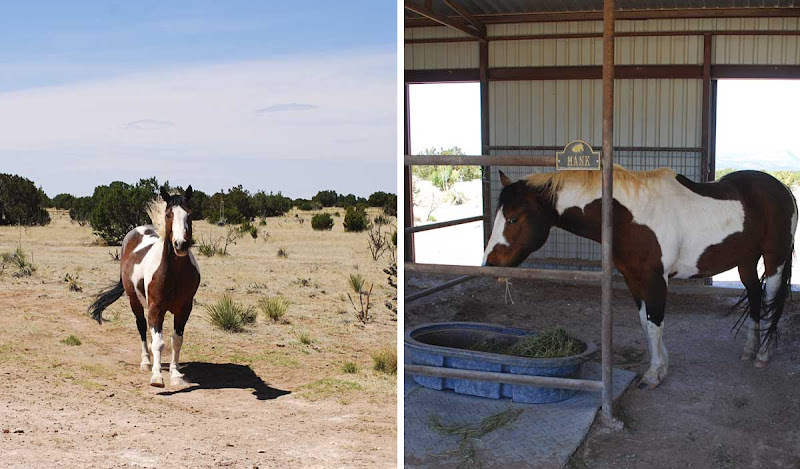 Alan and George pin their ears whenever Hank and Lyle move over to their hay tub - the horses ignore the warning and the burros back down immediately. Wimps. I really got a kick out of todays 'story' ... guess George and Alan are going to have to learn to get there sooner, but their looks at the doorway, and then moving on through are priceless! Hi Linda! Catching up on your blog. I ADORE your photos, hard to go a week without them!!! Wonderful pictures that capture the drama well. Good thing Alan and George are so supportive of one another. They are adorable. 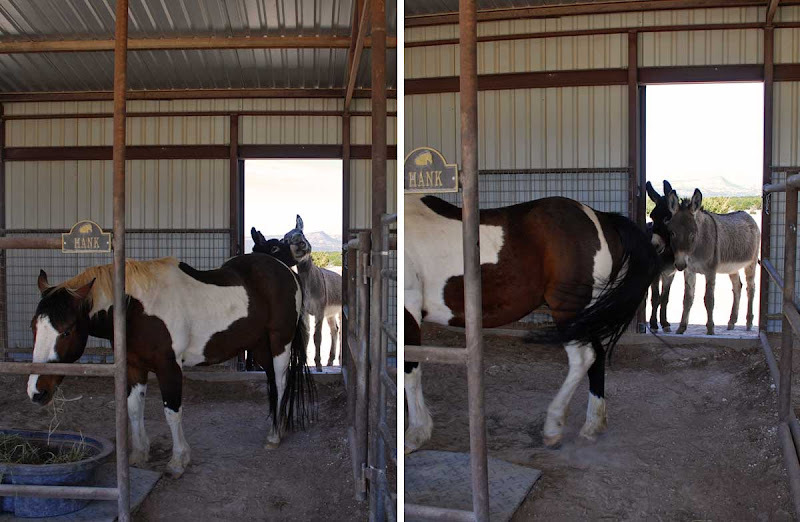 Heh, heh.........donkeys are sooo brave, huh? I think it depends on what is on the other side and if it's food, well...that makes them really, really brave! 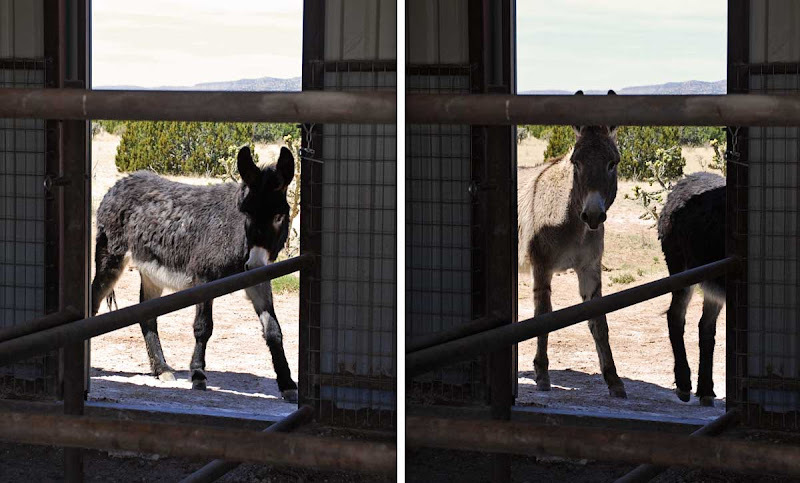 Their ears indicate submissive body language as they slip past Lyle--does this mean anything in burro/horse world? Or is body language different between the two? Heehee!!! Lyle's just smiling away: "Go on.... I'm not paying attention.... Or not much, anyway..."
They are creatures of habit arn't they? I like the comic relief with the donkeys. :) they are so cute! 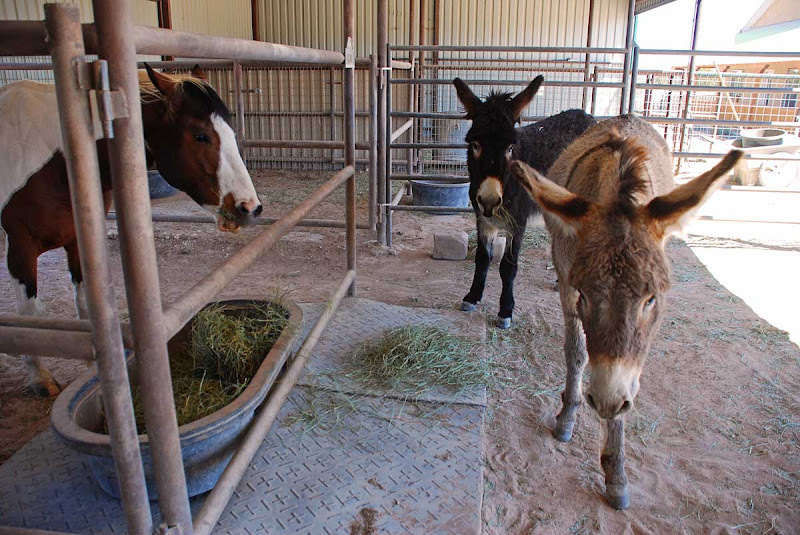 Dang donkeys are so funny about stuff like that...you can see their thoughts on their faces! Catching up on everyone's blog...you've been busy girl...nice job with your vaccinations! 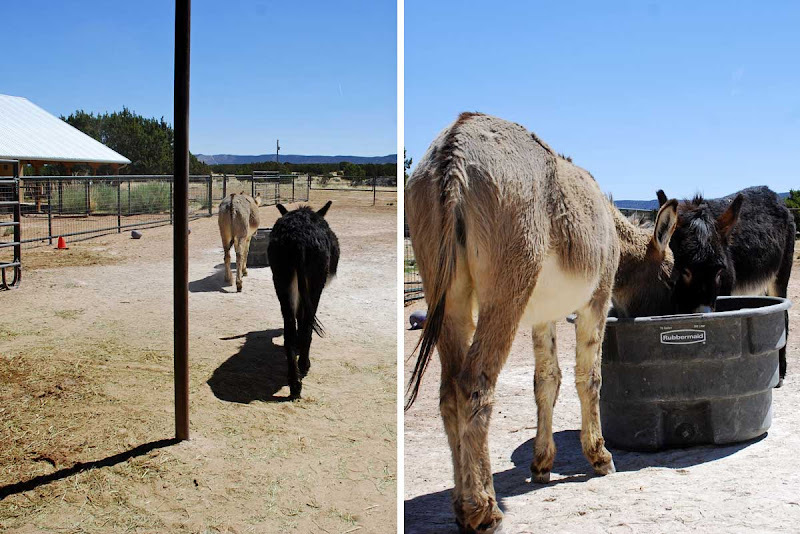 Dee J, the burros are very submissive around Lyle - they don't trust him at all, though he's never hurt either of them.